The wondrous power of the sun and moon mark our cycles of circular and linear time. We rely on them for light, energy, warmth, and continuity. The oceans and forests create habitat for a diversity of species whose existence we depend on, yet many of our human choices harm the earth. The burning of fossil fuels, pollution, and exploitation of land distresses our relationship with this majestic planet. Join me on a pictorial journey to celebrate the wonders of our natural and created world. Nourish is a book about hope and stewardship, as the drum symbolizes the heartbeat—the pulse of life—it connects us all. The eight twice-folded folios printed on both sides of the paper have endured over 100 runs through a Vandercook letterpress. I explored new artistic territory in this project; investigating color by mapping out fifteen different multi-color reduction relief prints, and experimenting with layered images on transparent paper. 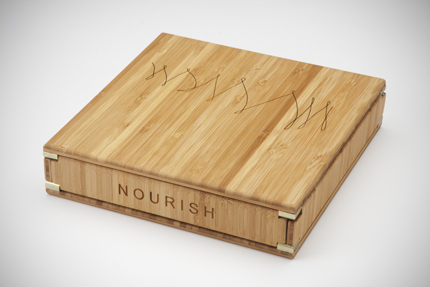 via 23 Sandy Gallery | Nourish by Diane Jacobs *LIBRARIAN’S CHOICE AWARD!.